Think Tank Photo has added a Sandstone color option to it Retrospective camera shoulder bag line which also adds the $154.75 Retrospective 6, a new size that caters to dSLR users who want to carry more lenses and mirrorless users who want to fit two small lenses front to back. New Color. Sandstone joins Black, Blue Slate and Pinestone. The Retrospective 6, is now available in Sandstone, Black and Pinestone. The company also announced the $599.75 Production Manager 50, a rolling bag designed to hold "an immense amount of gear, including lighting equipment and large light modifiers." One photographer will now be able to transport what used to require two assistants, the company said. "Pro photographers usually travel by car or van to where they are going to shoot," said Doug Murdoch, Think Tank CEO and lead designer. "Once a shoot is completed the set needs to be torn down and moved to the next location. Often times, there can be a time crunch where all the gear has to be loaded quickly. Carrying these bags up and down stairs and over rough terrain can be very cumbersome and often takes two people. The Production Manager 50 makes this time-sensitive, cumbersome process easier and quicker." New Assistant. At least it may feel that way. For more information, including dimensions, see the individual news releases below. SANTA ROSA, Calif. -- Think Tank Photo has just released enhancements to its popular Retrospective camera shoulder bag line. All of its existing Retrospective bags -- the Retrospective 5, Retrospective 5 Leather, Retrospective 7, Retrospective 7 Leather, Retrospective 10, Retrospective 20, Retrospective 30 and Retrospective 30 Leather -- are available in a new colorway, Sandstone. In addition, a new size, the Retrospective 6, is now available in Sandstone, Black and Pinestone. The Retrospective 6 caters to dSLR users who want to fit more lenses and to Mirrorless users who want to fit two small lenses front to back. Exterior: Durable water-repellant coating; polyurethane coating; sand-washed 100 percent cotton canvas (Pinestone and Sandstone); 1100D polyspun polyester (Black); YKK " RC Fuse (abrasion-resistant) zippers; antique nickel-plated metal hardware; nylon webbing and 3-ply bonded nylon thread. Interior: Closed cell foam & PE board reinforced dividers, 210D silver-toned nylon, polyurethane backed velex liner & dividers, 2x polyurethane coated nylon 210T seam-sealed rain cover and 3-ply bonded nylon thread. SANTA ROSA, Calif. -- Think Tank Photo has released the largest rolling photography equipment case on the market, the Production Manager 50. Designed to hold an immense amount of gear, including lighting equipment and large light modifiers, one photographer will now be able to transport what it used to take up to at least two assistants. It is easy to move, carry, work out of and stack among other gear. 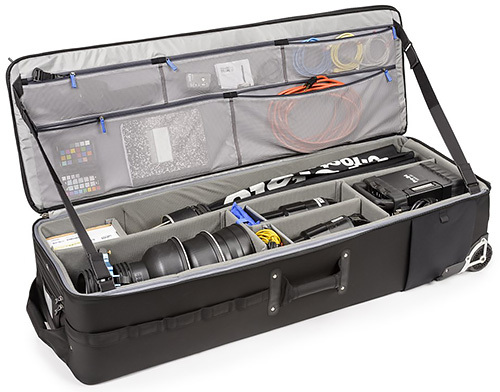 This large rolling bag features stabilizing, wide-set, shock-absorbing wheels that roll smoothly and hold up under the toughest conditions, the ability to lock the main compartment and secure the bag with the included lock and cable and a fully customizable interior with dividers to protect small and large lighting equipment including c-stands and large modifiers. "Pro photographers usually travel by car or van to where they are going to shoot," said Doug Murdoch, Think Tank's CEO and Lead Designer. "Once a shoot is completed the set needs to be torn down and moved to the next location. Often times, there can be a time crunch where all the gear has to be loaded quickly. Carrying these bags up and down stairs and over rough terrain can be very cumbersome and often takes two people. The Production Manager 50 makes this time-sensitive, cumbersome process easier and quicker." YKK RC Fuse zippers, 1680D ballistic nylon and super-stick velex (interior) contribute to one of the most robust products on the market. Weight: 20.7 to 29.8 lbs.